The mole is one of the most representative and most famous dishes of the Mexican cuisine. It is a preparation that has a lot of history because since Prehispanic times there was a similar preparation known as “mulli", that means mixture. With the arrival of the Spaniards and of all the products that they introduced in Mexico, the mole was enriched because it adopted some of these ingredients like the almond, although it did not lose its axis based on dried chilies . The almond mole is typical from the town of San Pedro Actopan, located in the Federal District. In this town there is a kind of cult to the mole and each year the mole’s national festival is celebrated. 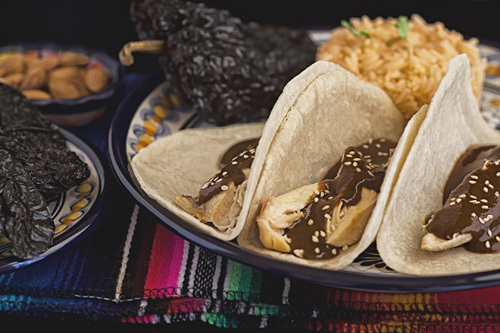 The peculiarity of this mole is that is combines hot, sweet, spiced and subtle flavors. The result is an elaborated salsa that is full of tradition and flavor. Serve it over some chicken pieces and accompany the plate with white rice and corn tortillas – everyone will love this dish. This recipe is difficult and complex... that’s the nature of the moles. Prepare the recipe with lard so you can taste the traditional essence of the moles. To make the mole plantain is used and don’t substitute it for regular banana because its flavor and consistency are not adequate for this mole. Among the ingredients that are used in the preparation the peanuts figure, that have to be natural. The total preparation time is of 40 minutes . With this recipe you will obtain 2 qts of almond mole. Remove the seeds and the veins of 5 ancho peppers and 5 mulato peppers; then reserve. Melt in a frying pan over low heat 1/4 cup of lard (2.2 oz). The 5 Mulato Peppers with the ones you worked. Fry the chilies that were put in the frying pan for approximately 1 minute 15 seconds, until they are lightly fried; stir regularly. Don´t fry the chilies for a long time because its flavor becomes bitter. Transfer from the frying pan to a blender, with a slotted spoon, the chilies that were fried; then set aside. 1/2 cup of Sesame Seeds. Mix the frying pan ingredients and fry them for approximately 1½ minutes, until they are lightly fried; stir regularly. Transfer from the frying pan to the blender, with the slotted spoon, all the ingredients that were fried; then reserve. Fry the frying pan ingredients for about 40 seconds, until they are moderately fried; stir regularly. Transfer from the frying pan to the blender, with the slotted spoon, the ingredients that were fried; then reserve. Slice the plantain that was peeled and reserve. Melt in the frying pan over low heat 1/4 cup of lard (2.2 oz). The Plantain slices that were cut. 1/2 teaspoon of Coriander Seeds. Mix the frying pan ingredients and fry them for about 3 minutes, until the tomatoes, the onion and the garlics are soft; stir regularly. Transfer from the frying pan to the blender, with the slotted spoon, all the ingredients that were fried. Also add in the blender 3 cups of chicken stock (25.3 fl oz). Mix the saucepan ingredients and bring the mixture to a boil over high heat; stir regularly. When the mixture boils reduce to low heat and cook it for about 5 minutes, until the chocolate has dissolved; stir regularly. Cook the almond mole for about 20 minutes, until it thickens and acquires a more intense color; stir occasionally. Tip: When the mole is served garnish it with peeled almonds. Did you like the Almond Mole? Prepare the mole with organic almonds and get amazed with its flavor. This is the chocolate that has to be used in the preparation. These fried plantains have very good flavor and they are of very good quality.